The increasing number of lipophilic drug candidates in development in the pharmaceutical industry calls for advanced drug delivery systems with increased bioavailability less day-to-day and food-intake-dependent. Many of these drug candidates possess poor water solubility, so that their dissolution rate in the gastrointestinal tract (GIT) limits their absorption following oral administration. In the past few decades, various lipid-based formulations have been investigated to enhance the bioavailability of such challenging drug candidates and to increase their clinical efficacy when administered orally. Recently, self-emulsifying drug delivery systems (SEDDS) have attracted increasing interests and, in particular, self-nanoemulsifying drug delivery systems (SNEDDS). SEDDS and SNEDDS consist in micro- or nano-emulsions of oil containing the drug that spontaneously form in aqueous media on mild agitation. Usually, they use high amounts of surfactant that may cause degradation and instability of the drugs, being moreover toxic for the gastrointestinal tract. 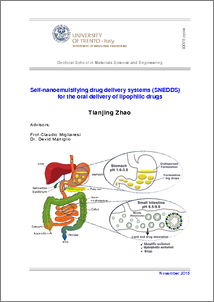 The aim of the present thesis was the preparation of novel self-nanoemulsifying drug delivery systems to overcome the shortages of conventional SEDDS or SNEDDS. To reduce the amount of surfactant, we formulated first a self-nanoemulsifying drug delivery system containing high proportion of essential lemon oil, that was characterized in terms of drug solubility, formulation stability, viscosity, emulsion droplet size, ζ-potential and in vitro drug release. Then, a pH-sensitive SNEDDS was developed that emulsify only at basic pHs. The goal was to protect the lipophilic drugs from the harsh acidic environment in stomach and render it available in the enteric tract where the bioactive compound should be absorbed.